I remember when I first beat Gears 2. I thought "Meh, it was alright." It was cool and all, but like most games in the middle of a trilogy, it just wasn't all there. I was quite pleased when I discovered about 10 minutes into Gears of War 3 that this was, indeed, the Gears I was waiting for. So much work was poured into making this last installment of the Gears series the best it could be, and Epic Games was able to deliver with what could very well be the greatest shooter I have ever played (so far). Gears 3 plays out much like its predecessors. You're able to run into cover, which is conveniently placed throughout random areas (though this time they did their best to make it look natural to the scenery, but some walls are literally just chest-high walls existing there for no real apparent reason, realistically anyway). Some guns have changed their Active Reload areas from the previous games. If there was reticle bloom in the previous games, I didn't notice it, because it's very prevalent in Gears 3. Some guns, especially the Retro Lancer must be shot in short bursts or else your accuracy goes out the window. Multiplayer is very similar to Gears 2 and Gears 1, with a few changes here and there. The biggest change is probably that Gears 3 is one of the only console multiplayer games to actually run on dedicated servers hosted by Epic Games, rather than Peer to Peer multiplayer like so many today do. In addition, the game adds an assortment of new weapons. The OneShot is an amazingly overpowered, but incredibly heavy and slow sniper rifle. The Retro Lancer is more powerful, has more recoil, and uses a traditional bayonet (oh how I love charging enemies with the bayonet). The Butcher's Cleaver is also now a usable weapon, but with limited number of swings. The Sawwed-Off is very powerful, but holds just one round at a time, takes a while to reload, and is only effective at close range. There is also a mission that takes place in first person, manning a gun in a tight area. Other than the new weapons, if you've played a previous Gears game, it's all familiar territory. StoryI must say I was absolutely amazed and surprised with the story of Gears 3. Shooters aren't usually known for having great stories, and I've played many where the writing was just atrocious. The ending has a bittersweet sense of finality, and that this is it: this is the end of the Gears series. I was incredibly surprised when the game had actually moved me to tears. POSSIBLE SPOILER: A certain song familiar to Gears fans also makes a return in one of the most pivotal moments in the game. Only a handful of games have ever moved me to tears, and Gears of War 3 is the first shooter that has managed to achieved this; and it did so twice during the campaign. The cinematics were well made and had incredible direction. I refuse to make the cliched statement that I "felt like I was watching a movie." No, not gonna happen. Go somewhere else for that, you won't get it from me. The story does have a few twists and surprises and as a surprise itself, they are executed masterfully. Certain parts were predictable (do you honestly expect me to believe I won't be shooting anything in this level?) but a few of the *real* twists were unexpected. Of course, a couple of them were also expected, but what do expect from an action game? Overall, I enjoyed the campaign, much, much more than I did the previous two Gears games. Horde & Beast ModesReturning from Gears 2 is Horde mode, except this time you can purchase certain defenses and decoys, so it sort of becomes Horde Mode meets tower defense. Other than having to purchase ammo boxes and the new defenses, Horde mode is essentially the same gametype it was in Gears 2. However, there is a twist to Horde mode found in the brand new Beast mode. It's similar to Horde mode, except there is a reversal and now you're the Locust and you're trying to kill the humans. The humans have defenses and you can choose which unit you want to use until you die, and then you can choose another unit or the same one. However, there is a time limit to each round and you must kill all humans within that time period. You get just one minute, but you gain additional time for each human killed or defense destroyed. But even then a minute is simply not enough and Beast mode as it stands right now is very difficult if played alone. I'm too badass for your crap. I was quite pleased with the way Gears 3 has turned out. It's definitely a great game in its own right, and also a great game compared to other shooters out there. I cannot recommend this game enough, especially if you disliked Gears 2. 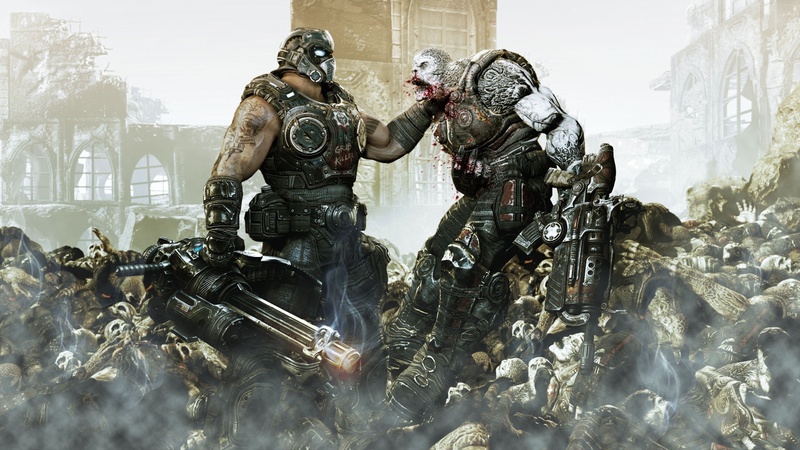 Gears 3 more than makes up for Gears 2's launch woes. I do not like the fact that some gun skins have to be purchased (as in, with real money) and I will probably never find myself buying any of those. The different multiplayer skins are interesting though, and though I'll probably never get around to unlocking all of them, there are a few choice ones that are probably worth using. I highly commend the team at Epic who poured their heart and soul into this final installment of the franchise, and I personally believe might just be one of, if not the greatest shooters I'll ever play. It will take a bit more for shooters to impress me, but I hope that I will one day again be impress. After all, that's what reviewers live for. Man, can't wait to get Gears 3 now.